If you're on the hunt for a casual yet chic look, marry a black fringe leather open jacket with a tan button skirt. Both pieces are totally comfy and will look fabulous together. Wearing a pair of brown snake leather ankle boots is a simple way to add some flair to your look. If you're hunting for a casual yet totally stylish ensemble, opt for a blue denim shirt and a white pleated mini skirt. Both pieces are totally comfy and will look fabulous paired together. Lift up this outfit with Chloé brown rylee 60 boot in python print calfskin. If you're looking for a casual yet chic outfit, make a white coat and blue ripped skinny jeans your outfit choice. Both items are totally comfy and will look fabulous paired together. 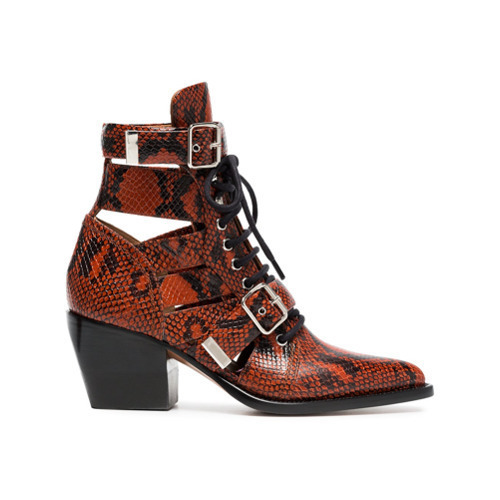 Bump up the cool of your ensemble by wearing Chloé brown rylee 60 boot in python print calfskin. 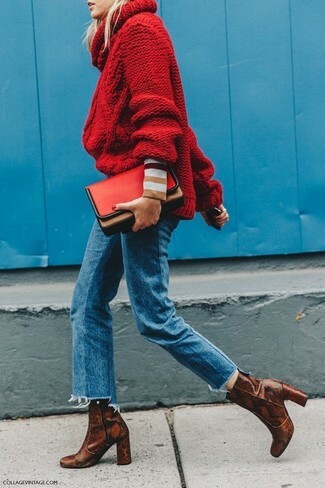 If you're on a mission for a casual yet stylish getup, go for a red knit turtleneck and blue jeans. Both items are totally comfy and will look fabulous together. 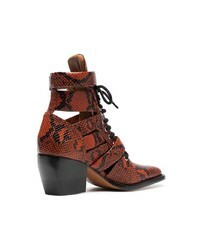 Up the ante of your getup with Chloé brown rylee 60 boot in python print calfskin. If it's comfort and ease that you're looking for in an outfit, opt for a grey sweater dress. When it comes to footwear, this getup pairs nicely with brown snake leather ankle boots. If you're on the lookout for a casual yet absolutely chic outfit, make a brown shearling jacket and blue jeans your outfit choice. Both garments are totally comfy and will look fabulous together. 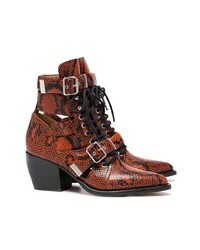 Dress up this look with Chloé brown rylee 60 boot in python print calfskin from farfetch.com. If you're on a mission for a casual yet absolutely chic getup, team a dark brown shearling jacket with blue flare jeans. Both items are totally comfy and will look fabulous together. Bump up the cool of your look by complementing it with Chloé brown rylee 60 boot in python print calfskin from farfetch.com.